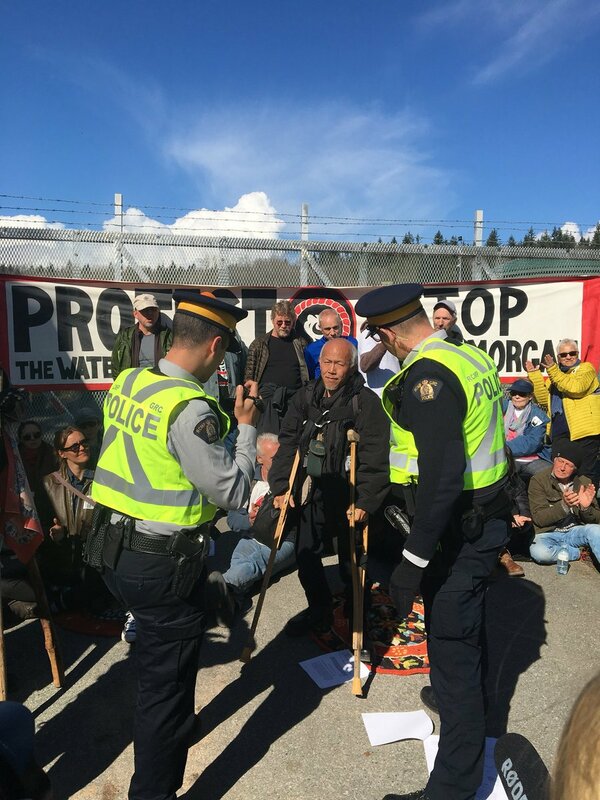 Twenty-eight Indigenous people, community members, families and retired teachers peacefully blocked the gates to Kinder Morgan’s tank farm for four hours until the RCMP moved in to arrest them late afternoon. Kinder Morgan’s pipeline and tanker project is opposed by the Province of British Columbia, the State of Washington, the cities of Vancouver, Burnaby and Victoria, and 19 other municipalities, 250,0000 petition signers,and more than 23,000 Coast Protectors who have taken the pledge to do “whatever it takes” to stop Kinder Morgan. ...Local resident Walter Hardy told National Observer he was there to support the protest because he believed a large increase in the transport of diluted bitumen — one of the petroleum products in the Trans Mountain pipeline — was bad for British Columbia. "My emotional response to this is that the risk of a tanker spill in Burrard Inlet is just unimaginable for many, many reasons," Hardy said. "There's marine life, and Indigenous fishing...but the worst is [in the event of a spill], Vancouver will drop multi-billions of dollars, and it would be a complete disaster. This pipeline is just not necessary. I consider that Alberta has not used their resources wisely. With (late Alberta premier) Peter Lougheed, they had a system in place....but [Alberta] shouldn't be foisting this on people who don't want it." "We have the right to protest," Thomas-Müller said, while sitting in front of the fence, which they'd covered with a protest banner. "If the RCMP decide to enforce the injunction, that's entirely on them...We're here to make our opinions known." "We've already seen with Northern Gateway pipeline that federal approval doesn't mean anything in the face of social movements...Justin Trudeau's going to get a similar lesson," he said. "Government approvals mean nothing. It's communities that grant consent." Thank you for being there today, and know there will be others, tomorrow. Are there any fundraising sites set up for their bail? Good to see how real this is. Thanks for the updates.